Google Maps for Android is fantastic. Between its free GPS Navigation feature, speedy downloads thanks to vector-based maps, and offline caching, the app is leagues ahead of the Maps app on iOS. And it keeps getting better. Today, Maps for Android is getting upgraded to version 6.0, and it includes a long-anticipated feature that presents a huge technical challenge: indoor maps. Yes, you’ll now be able to fire up Maps in some malls, airports, and department stores to get your bearings, complete with that ‘little blue dot’ that shows you where you are. You’ll be able to download the app from Android Market right here. 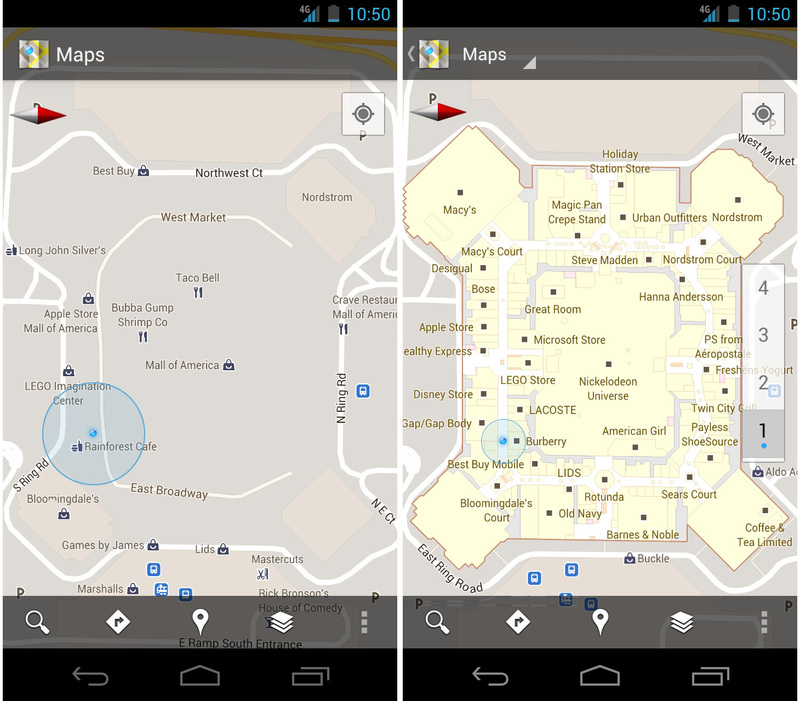 Google Maps has offered some basic indoor mapping functionality before now (as you can see in the left screenshot below). But the level of detail has always been seriously lacking, as has the accuracy of the blue dot. With this new release, Google has optimized its technology for indoor venues, so accuracy should be much improved, as are the maps themselves. It’ll even automatically detect what floor of a building you’re on and adjust the map it’s displaying accordingly. The initial version of the indoors maps is missing a couple of obvious features. For one, search doesn’t yet work with it — so while you’ll be able to scroll around a map to find a restroom or the shoe department, you can’t just start typing. Likewise, there aren’t any turn-by-turn directions (which may sound silly, but would actually be very useful in, say, a large train station or airport). These seem like logical candidates for future releases, though. The feature is also going to be at the mercy of the various wireless signals your phone is receiving. GPS signals are rarely available indoors, so the app will primarily be taking advantage of cell tower signals and Wifi networks to determine your location. If those aren’t available, accuracy will suffer. This probably won’t be an issue at large venues like malls and airports, where Wifi networks tend to be common, but I’m curious to see what Google plans to do for venues that aren’t already littered with Wifi hotspots. Google isn’t talking about any plans to roll out dedicated hardware, but if I owned a large store, I’d probably be open to installing devices that would boost Maps’s indoor accuracy even further. Today’s launch includes participation from many major airports, as well as some big-name retailers like IKEA (which has mapped out all of its stores) and The Home Depot. Of course, Google can’t work directly with each and every indoor venue, so it’s also launching a self-serve tool that will allow store owners to upload floor plans and/or blueprints of their venues. The tool also includes a feature that will help map GPS coordinates to interior of the store.